The Spanish Synagogue (Španelská Synagoga) in Prague sits on a site that was previously the Old Shul, the oldest Jewish temple in Prague (circa 12th century). When the Jews were expelled from Spain during the reign of the Catholic monarchs, one group found shelter in Prague. The Old Shul was given to them as a place of worship and from that time on, it was also called the Spanish Synagogue. In 1868, the Old Shul was demolished and replaced with a neo-Moorish building whose architectural style is a reminder of the golden age of Jewish culture in Spain. The new synagogue was equipped with the latest technology of that time, with an emphasis on good acoustics as temple music and singing were held here frequently. František Škroup, the composer of the Czech national anthem, served as organist here between 1836-45. The new Spanish Synagogue has a central, square floor plan which is bounded on three sides by raised galleries which open onto the main nave. Its interior walls, doors and gallery balustrades are richly decorated with elaborate Moorish polychrome, gilded motifs and stained glass. Although the interiors were restored in the 1950s, the building had to be closed in 1979 due to structural problems. It was after a long delay of almost 20 years before the reconstruction was carried out and the building re-opened. Today the Synagogue is one of the six locations for the Jewish Museum (Židovské muzeum v Praze), the most visited museum in the Czech Republic. The Museum has one of the most extensive collections of Jewish art in the world and artefacts and books which tell of the life and history of Jews in the region. If you are interested in learning more about the Jewish quarter and Prague’s Jewish history, there is a Walking Tour of Jewish Prague that you can join which includes entry to the Jewish Museum. With its long history of hosting music, the Spanish Synagogue also offers a diverse programme of classical and contemporary music. 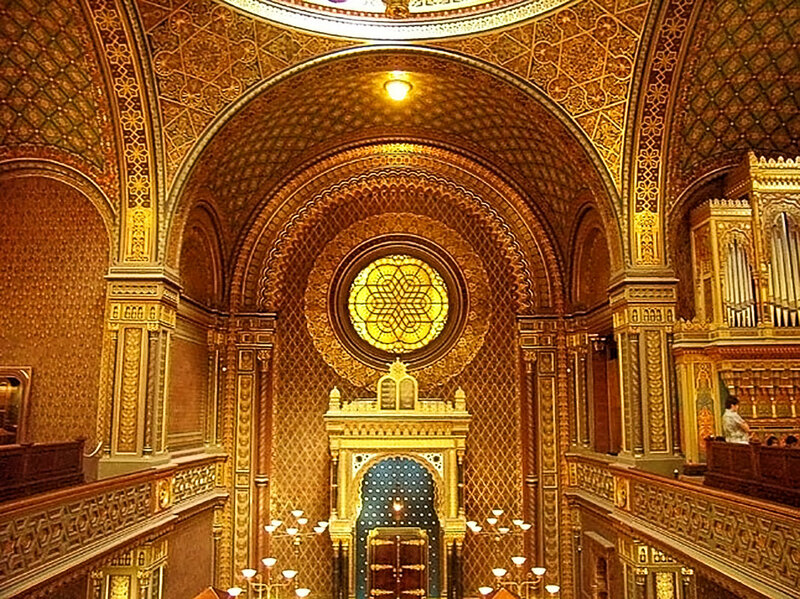 With its stunning golden interiors and good acoustics, the synagogue is a must-visit for anyone looking to enjoy some concerts in Prague. See what’s on at the Spanish Synagogue Here. The Spanish Synagogue is located in the centre of Prague, on the corner of Dušní and Vezenská Streets. You can get there by Metro: Staromestska (line A).